There is a disease in some Doberman Pinschers that can be undetected until too late called Occult Cardiomyopathy. Let’s learn a bit about it. Occult cardiomyopathy (OC) is a slowly progressive heart muscle disease that results in abnormal heart rhythms (arrhythmias) in Doberman pinschers. The type of arrhythmias it causes are often ventricular premature contractions (VPCs) and ventricular tachycardia (VT), it is also called arrhythmogenic cardiomyopathy . Dobermans with OC may have no clinical signs for long periods, which is why the disease is referred to as occult or silent. Eventually the dog develops arrhythmias and, later, dilated cardiomyopathy. OC runs in certain lines of Dobermans, so a genetic factor is involved. It can be traced back to the original seven sires of Doberman lines in the United States, three of which died suddenly when they were middle-aged. OC can start as early as 9-12 months of age, but most dogs are between 2-4 years old. By 6 years of age, about 50% of Dobermans have OC. Most dogs with OC have no symptoms. Their arrhythmias may be detected on a routine physical examination or on a screening electrocardiogram (ECG) or Holter monitor study. Dogs with more frequent VPCs or VT may have fainting episodes (syncope) or they seem to pass out for short periods of time(like seconds) and then come back. About 30% of affected dogs die suddenly, without prior symptoms. Some dogs will show tiring with minimal exertion as well. Since OC is very prevalent in Dobermans, annual screening of adult dogs often starts at 2-3 years of age, and may include a 24-hour Holter monitor and echocardiogram (heart ultrasound) study. The likelihood of finding VPCs, VT, or echocardiographic changes increases as the dog ages. Once arrhythmias have been found, the only way to diagnose OC is to rule out all other causes of ventricular arrhythmias. In some cases hospitilization is needed to stabilze these dogs depending on test result or clinical signs. Some can be treated as an outpatient with frequent rechecks early in the course of medications. Unfortunately, the more severe the arrhythmia, the greater the chance of sudden death. Not every drug works in every dog, so sometimes a dog must be switched from one drug to another to control the ventricular arrhythmias. Side effects can occur so communication with your vet is needed to best administer the proper care. Affected Dobermans require frequent ECGs until their VT or VPCs are controlled. Ideally, a Holter monitor is applied to dogs with non–life-threatening arrhythmias to document the frequency of the arrhythmias prior to treatment. Another Holter recording is done after the drug has reached adequate blood levels, to judge how effective it is in controlling the abnormal beats. Affected dogs require antiarrhythmic therapy for the rest of their lives. Echocardiograms may be done every 6-12 months to monitor for evidence of dilated cardiomyopathy, which can follow OC. Dobermans with infrequent VPCs that are feeling well usually develop changes on their echocardiograms within 1 year. Within 2 years, their VPCs and heart changes often get worse, and 30-50% of these dogs may die suddenly. 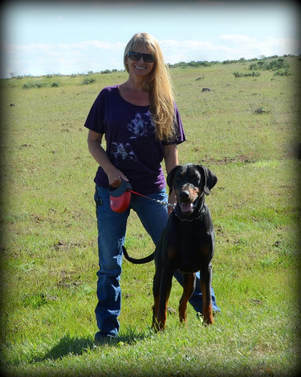 Dobermans with severe VPCs or VT that are well controlled with medication can live up to 1 year or longer. No drug is 100% effective in preventing sudden death. The better the arrhythmia is controlled, the less likely it is that sudden death will occur. Holter monitors provide the best way to evaluate how well the medications are controlling the arrhythmias. If dilated cardiomyopathy develops, the dog’s life span is only weeks to months (average, 3-4 months). Because OC has a genetic basis and runs in families, it is wise not to breed dogs that have the problem. This is a problem widely seen in Dobermans so do your research when you get a puppy and ask the breeder about this and whether they follow up their puppies into adulthood to see if any show this. See how old their dogs are in the kennel as that can give you an idea of whether the dogs can live past a certain age as not always are folks forthcoming about this but many reputable breeders are keenly aware of this and make every effort to select the parents that don’t show this in their puppies or have lines of dogs that are free of OC. It is a bummer of a disease. Some lines of dogs in the USA and elsewhere stem from a very narrow band of dogs, or just a few dogs and over time in breeding or very close line breeding will lead to the exhibiting of poor genetic traits, such as OC or in King Cavalier, mitral valve disease. DOBERMANS AND DILATED CARDIOMYOPATHY whats the problem? Many dog breeds are affected at various frequencies but in the death-rate statistics of all breeds the Doberman by far takes the sad first place in both the USA and in Germany. Mr. Kraft (1989), from the University of Munich, presents heart death statistics from dissection materials of different pathological institutes where frequently the Doberman stands before the Great Dane, the St. Bernard and the German Shepherd Dog. Beyond it Mr. Kraft presents the result of a regional survey of the Doberman Club (VDH) from South Germany. From 92 cases of deaths, 24 died of death by heart failure. The extensive statistics of death by heart failure in pedigreed dogs, by Calvert and Pickus (1982, 1989) from the USA, look like the situation in Germany. The Doberman by far leads the Great Dane, the Irish Wolf hound and the St. Bernard. 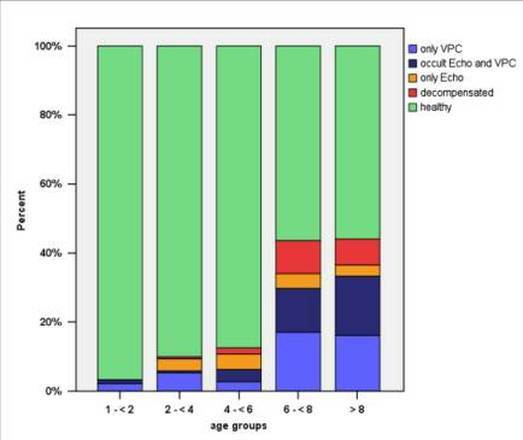 The majority of affected Dobermans die at the age 3 to 5 (van der Zwan 1987). Both in North America and in Europe there is an increasing reduction of the death age (Kollenberg 1998). In general, two progressive forms can be distinguished in the Doberman, dependant on the quickness of death and on other features (van der Zwan 1987, Schuler 1997). Type A: arrhythmia. With this most frequent type of death by heart failure the death occurs allegedly without (2?) external warning. All of a sudden the dog collapses and dies. There were few publications about the diagnosis of the dog's arrhythmia but in the long-term ECG it should be similar to that of a human being. Type B: heart muscle weakness. With this less frequent type of death by heart failure a lingering development for a prolonged period is diagnosed. The dog often coughs in the morning as a result of water accumulation in the lungs. Diagnostically, heart enlargements and vessel changes can be located long before the death occurs. A partly X-chromosome polygenetic hereditary transmission can be assumed because, according to the statistics, approximately 3/4 of all Dobermans that died of heart failure, are males. The noticeable frequency of death cases over several generations (Fig. 1) can be identified in the German and American Dobermans' pedigrees. 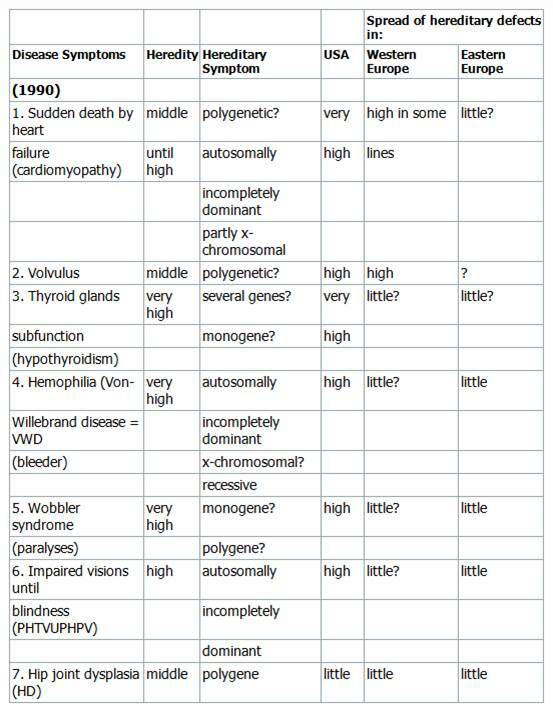 The heredity of sudden death by heart failure must be assessed as average to high. A complicated polygenetic hereditary process could exist because the symptom of death by heart failure is based on different heart defects and proceeding on the assumption that these defects were affected by certain environmental impacts. The cooperation between breeding clubs and genetic scientists is necessary for a better understanding of genetics. Calvert and Pickus recommend that the clubs utilize as many breeding animals as possible, along with their descendants, to take a standardized heart examination. A combination of several methods is useful, like for example, a long term ECG for diagnosis of function changes and fan ultrasound test for size recognition identification and x-ray.